I really like Plants vs. Zombies, but everything about the idea of PopCap mixing its quirky tower-defense title with third-person shooting just sounds awful. We have more than enough games prominently featuring guns, grenades and flesh-eating zombies, so why try to burn away one of the best mobile series’ charm with hot lead? Leave it to EA and PopCap to prove me absolutely wrong. Although it may not sound like a match made in software heaven, Plants vs. Zombies: Garden Warfare is much more than a simple cash-in on a popular license. The whimsical, class-based shooter looks to incorporate all the depth and mechanical prowess found in a multilplayer title like Team Fortress 2 into the strategic fun of its source material. A handful of fan-favorite units and welcomed newcomers were shown to be playable at both EA’s press event and behind closed doors during E3, and while I didn’t get my hands on the actual game, I walked away wanting to grab a couple of friends to help defend my own garden. 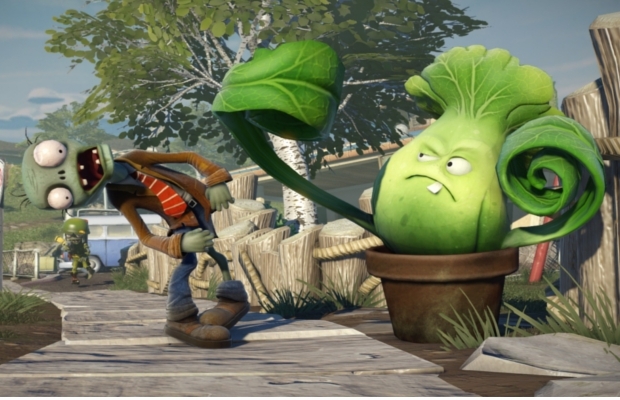 The dynamic that’s made Plants vs. Zombies so popular remains core to Garden Warfare. Zombies are coming for your home base, and on their path, there are locations where weaponized plants can be set into pots of soil. However, instead of simply acting as an outside presence watching the chaos ensue, you’re allowed to jump right into the action in Garden Warfare. Multiple plants, from close-range, bushy brutes to cacti wielding precision needles, can be used to pop the heads right off of the incoming undead. It looks to play like your standard non cover-based, third-person shooter, but the tactical element of the stationary units coupled with the fact that you’re controlling walking plants makes it feel anything but ordinary. Things seem to get pretty hectic as the waves of zombies continue to pour in. We were shown a squad of disco-dancing enemies, a giant creature twirling a heavy club and even a robotic green beast that seemed to scrap the clouds with the plates on his head. All of these foes were best dealt with through the game’s strong cooperative support, which lets your friends take control of the swath of classes whose abilities tend to encourage strong team play. The sunflower is actually meant to be used as support, so really, Garden Warfare just feels like a game that’s built from the ground up with multiplayer in mind. And while it wasn’t shown, there will be a 12-on-12 competitive mode in the final product. Players will have the option to side with either the plants or the zombies before the battle begins, but as of now, PopCap is keeping that portion of the project under wraps. It’s not what you expect from a Plants vs. Zombies game, but I’d be lying if I said I wasn’t excited to see more of this strange clash of genres. Garden Warfare seems to have enough good ideas to stand out among your average gray shooters, and with Plants vs. Zombies 2 also in the works, it looks as if we’ll be getting the best of both greenery worlds quite soon. Look for this shooter to debut on Xbox 360 and Xbox One sometime next year.